New video from inside the Westchester County Jail shows corrections staffers and medics declining to transport a dying prisoner to the infirmary, even after he collapsed to the ground. The inmate later died of a heart attack. Chris Glorioso, who has been reporting this story for more than a year, has the jailhouse video. 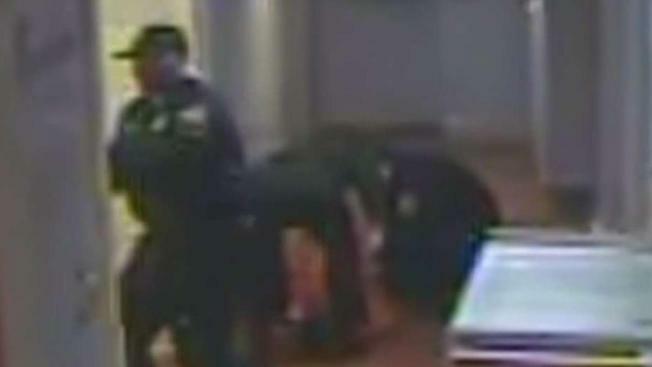 The I-Team has obtained surveillance video from inside Westchester County Jail showing corrections officers and medics declining to take an inmate to the infirmary when he collapsed on the floor, complaining of chest pains. The prisoner, Rashod McNulty, died of a heart attack after jail staff put him in a wheelchair and wheeled him back to his cell. The video is part of a wrongful death lawsuit filed by family of McNulty, who accuse Westchester County and its jail medical provider - a private company called Correct Care Solutions - of negligent medical care. After the video became public, Westchester County Executive George Latimer issued a statement promising the county would spend the next twelve months looking for a new medical provider. After seeing video of the minutes leading up to Rashod McNulty’s death, Legislator Damon Maher (D – New Rochelle) said it would be hard to justify hiring another private contractor to treat sick inmates. “Certainly, looking at this video, it would take more persuasion to get me to go along with the point of view that we should have CCS or another for-profit entity running the medical department [inside the jail],” Maher said. This year, Westchester County exercised an option to extend the CCS contract until the summer of 2019. Latimer said the decision was made because the incoming administration had "insufficient time to bid out the contract before the June 2018 expiration date." A spokeswoman for CCS declined to address the jail surveillance video citing the active nature of the litigation. In court documents CCS has denied its medics were negligent in their care of Rashod McNulty. When he suffered the fatal heart attack, McNulty was awaiting sentencing on a drug conviction. The I-Team has obtained surveillance video from inside the Westchester County Jail, showing corrections officers and medics declining to take an inmate to the infirmary when he collapsed on the floor, complaining of chest pains. The prisoner, Rashod McNulty, died of a heart attack after jail staff put him in a wheelchair and wheeled him back to his cell.